Are you using a cooling or lubrication solution with toxic or hazardous properties? Take a look at MagLube’s wide array of organic lubricants for green manufacturing lubricating systems. All MagLube minimum quantity lubricant, including liquid and solid block, is environmentally friendly, green products and require no hazardous waste handling or disposal requirements. Whether you need MSDS sheets or other products in small quantities, large quantities, or sample sizes, check out our earth-friendly organic lubricants right here at MagLube.com. Equipment Total Cost of Ownership (TCO) is impacted by many facets of equipment operation: throughput, downtime for preventative maintenance or repair, efficiency, consumable costs, etc. MagLube precision micro-lubrication solutions put the exact amount of minimum quantity lubricant when and where you need it – and only when and where you need it. This eliminates tremendous amounts of waste and cleanup associated with other industrial lubrication systems. 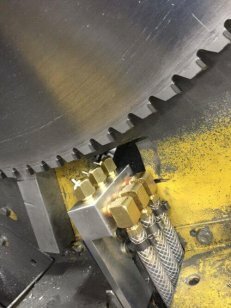 In addition, precision lubrication reduces friction and heat, as well as, increases feed rates, resulting in reduced maintenance time and cost. Looking to replace your existing industrial lubrication systems with micro-lubrication? 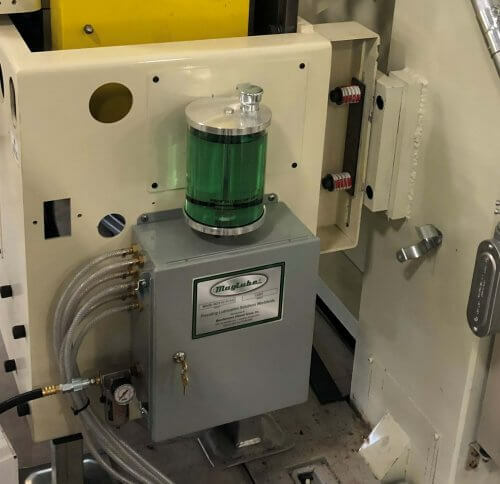 MagLube’s green manufacturing lubrication systems present a true positive Return on Investment (ROI) and typically enable companies to achieve a 100% ROI in just months! Contact us today to find out what ROI, Net Present Value (NPV), and Payback Period can be achieved with MagLube solutions. Traditional materials of machining lubricants are petroleum or synthetic based products that typically mix 10 to 20 parts with water to flood the work-piece and tool to prevent heat. These traditional machining lubricants are also known as metalworking fluid or flood coolants. While they have little lubricating properties, the concept of metalworking fluid is to cool the tool and work-piece by means of quenching or carrying the heat away after it has already occurred. As a leader in the industrial lubrication equipment industry, MagLube designs and installs custom applications for virtually every customer they have and have been doing so for over 2 decades. Monday – Friday: 8:00 a.m. – 4:00 p.m. E.S.T.